I’m rather proud of my recycling skills on the grey halter top I made this afternoon – the grey jersey fabric came from a pair of oversized lounge trousers I picked up at a Naked Ladies Party (it’s not what it sounds like – it’s a party to get rid of all your old clothes and pick up new ones off other ladies! 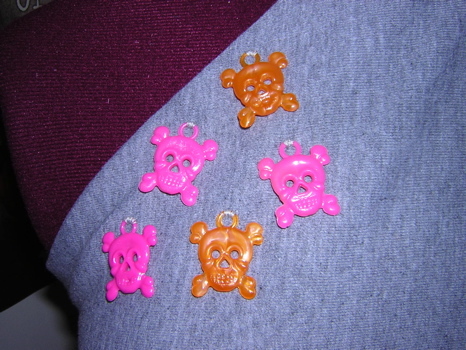 ), the pattern was a gift from benevolent craftster RiAnge who was cleaning out her pattern stash, and the fantastic plastic skull charms were a gift from my friend Caramel who picked them up at a craft sale in NYC last time she was over. So in total, I spent absolutely nothing and I’ve got this fab top to wear for the rest of the summer! 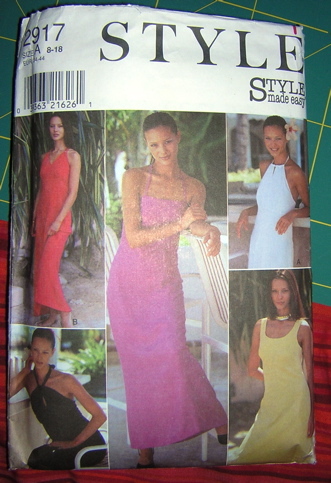 As you can see from the pattern envelope, Style 2917 is actually a dress pattern with a variety of necklines. 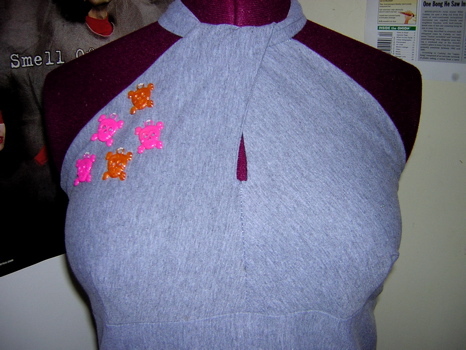 I really liked the one in the bottom left corner (in black) so I just took the top bodice pattern piece and attached it onto two rectangles for the back and front bottom pieces of my shirt. The top bodice piece has a really ingenious twist design that I’d not seen done before – each half of the top is actually two different sides of the fabric so if you were feeling crazy you could easily split the colours or teeshirt print between the two. I really love how this fits and I’m definitely going to reuse the design next time I have a teeshirt that needs reconstructing! 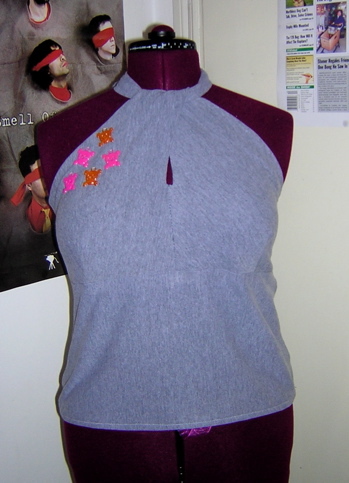 Separator image Posted in Gallery and tagged with knit, recycled, style, top.